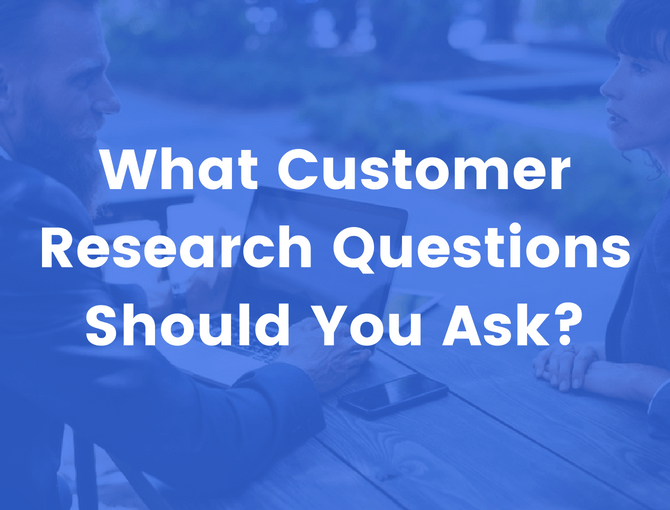 What Customer Research Questions Should You Ask Your Audience? As a business, you’ve decided to put some investment into audience research. Specifically, you want to have one-on-one conversations and interviews with potential and existing customers. Maybe you want to validate your next product idea, or make sure your positioning and marketing is on point when it comes time to launch. Maybe you’re simply looking to build on market research that you’ve done in the past. Whatever prompted you to get started, interviews are a fantastic method of generating the insights you need to grow your business. But while you’ve got your audience’s attention for an interview, what kind of customer research questions should you ask to maximize your investment? The most basic type of customer research isn’t about your product, your marketing, or your business. At this stage of customer research, you’re looking for general information about your audience’s life. You’ve identified people that you think are in your target market—now it’s time to use curated questions to identify their burning needs and pain points. Simple informational customer research questions are the foundation of strong marketing because they help you identify the most important pain points. Although they’re often overlooked, there’s no substitute for asking these questions point blank. Often, especially if you have a lot of customer interaction under your belt already, you’ll find that your audience confirms what you already suspected. But frequently enough, you’ll uncover answers that question an underlying assumption, or that help you slightly (yet significantly) tweak the language you use in your marketing. The exact questions you ask will need to be tailored to your audience and the problem you’re trying to solve. What’s the hardest part about _____? Can you tell me about _____? How does ____ make you feel? Your audience has a past that follows them to your business. Anyone with a problem or pain point has probably done some kind of research or taken some kind of action to address it. And yet, many businesses market their products and services without knowing what their audience is looking for—or what they’ve already tried. What have people already tried to address their pain points? Where do they look to find more information about their dealing with their problems? How satisfied or dissatisfied have they been with what they’ve tried? Why? At this stage of the customer research process, you’re looking to see what products and services they are already using. This helps you identify opportunities for your business, your marketing, your products, and your positioning. The exact questions you ask will need to be tailored to your industry and the solutions that currently exist in the marketplace. What have you thought about doing to solve ____? What have you already tried? How well did ____ solve your problem? When you were getting started with _____, what were you thinking about? Where do you go to find information about _____? What surprised you about ______? Often, your most valuable potential customers are your existing customers. People who have already bought from you have already expressed interest in what you have to offer. They are the ultimate qualified lead—because they have already bought. In addition to being great candidates for repeat business, up-sells, and cross-sells, existing customers are a gold mine of information about your product. Conducting customer research to study customer satisfaction is crucial—it can help you refine your marketing, improve your customer service, offer better products, and increase customer retention. Is your product what they were expecting, or not? Maybe it’s time to adjust your marketing. Does your product solve their problem? If not, maybe it’s time to adjust what you offer. Do they have questions your product doesn’t answer? Maybe you can add to your product, or develop other cross-sells and up-sells you can offer to the same audience. Even if it turns out that your customers are totally satisfied and there’s nothing at all that you could improve on (which is unlikely), knowing that you can afford to focus on other parts of your business is a valuable insight in itself. The exact questions you ask will need to be adjusted based on the types of products and services that you offer. If you could change something about _____, what would you change? What’s your favorite part of ______? How well does _____ solve your problem? What else can we do to help? Now that you’ve solved ______ , what’s next? Subscribe to the ActiveCampaign blog for the latest product news. alert Please enter a valid email address to continue. With market research results in your back pocket, you can move forward with your marketing and business—confident that what you offer matches what your customers need. A trial is worth a thousand words. Get started today, no credit card required.